Prepare for your yearly tasks with this 2012 Printable PDF One Page Yearly Calendar Template, available for free download. Download and print this 2012 Printable Yearly One Page Calendar and circle the important days of the year. 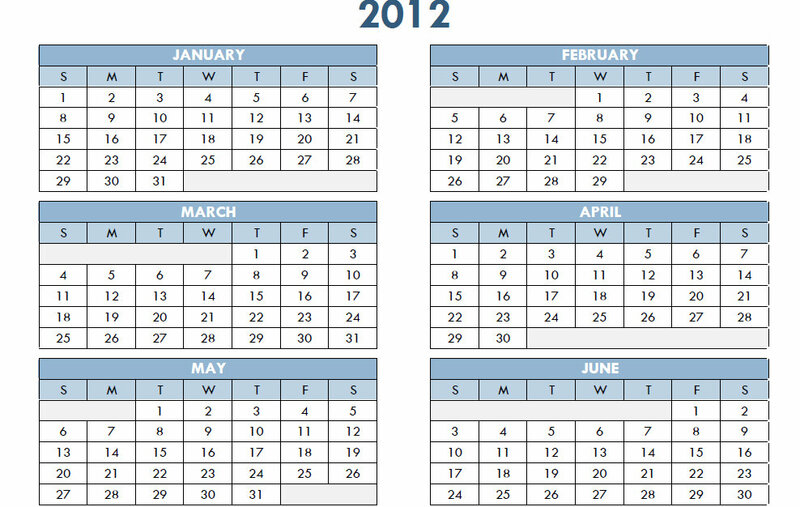 Download the 2012 Printable PDF One Page Yearly Calendar Template today to start using your new calendar instantly. We have the best selection of planning and organizational templates available on the web. Whether you are looking for a printable 2012 calendar on one page, or a multiple page document, there’s no doubt we have exactly what you need. Whenever possible, we strive to offer every download free of charge. It’s just another reason our visitors trust MyExcelTemplates for high quality materials and real-world business and personal solutions. This 2012 printable one page yearly calendar can be downloaded, used and printed right away. Even better, we are offering this 2012 one page calendar for free. Keep track of all your major events with this 2012 yearly calendar. All the information you need is right in front of you. Download this 2012 one page yearly calendar today. Remember, if you love this 2012 one page calendar, please share this page with your friends and coworkers! With this printable 2012 calendar on one page, you’ll be able to stay up to date and and keep appointments easily. As an added bonus, this printable 2012 calendar on one page is available for a free instant download so you can start using this template right away. There’s no better collection of useful free materials online and we hope you’ll keep coming back. Feel free to browse our extensive collection of calendars. Not only will you find a free printable 2012 calendar on one page, but feel free to grab one for next year, or even the year after! 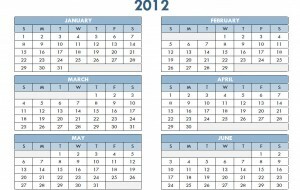 At MyExcelTemplates, you’ll find a great template or printable 2012 calendar on one page or any other printable PDF. Stay organized and up-to-date without having to spend your hard-earned money! Yes, Thank you for the one year calendars. Very much appreciated. Thanks for the one page yearly calendar template.. It is useful for me to mark the holidays and have the overview and plan my activities around it…. I needed a calendar in front of me quickly and was lucky enough to find this site. Thank you so much.